You know, sometimes inspirations for a blog come out of the funniest time and places. Tonight I was simply looking for another song to add to the playlist that is on the website. I had a few ideas in my head for song choices, one of them being "Circle of Life" from "The Lion King". So I went to check out a few videos and...........BOOM! There was my inspiration for my very next blog. Not only did I find what I wanted, but I also found a couple of amazing performances of "The Circle of Life". As well, watching the performances brought me back to one of my favorite childhood memories of being able to go see "The Lion King" on stage in London. I was brought up on musicals and there is no doubt in my mind that "The Lion King" live on stage in London was my favorite. If you ever get a chance to, you have to see this musical at least once in your life. They have a stage that actually moves where stuff can come out from the floor. And the costumes are spectacular, I've never seen anything like it. 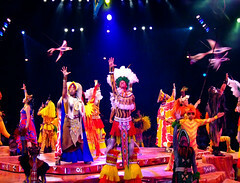 The opening number "The Circle of Life" is one of the high points in the musical and it is something that stays in your mind for a long time. I hope that I sometime in my life, I get to see the musical again. But while I was searching through performances of "The Circle of Life", there was one performance that caught my eye. Remember how I wrote a blog earlier about Jennifer Hudson's life. Well I discovered a video of her performing "Circle of Life" on American Idol so many years ago. How did she do? Well how about you be the judge of that? I've put the video of the performance right here so you can decide for yourself. All I can say is that I have no doubt that anyone who can belt out a performance like that is destined for greatness. And although she didn't win American Idol, Jennifer Hudson would not disappoint us in the days and years to come after that awesome performance.